Qualcomm has leaped ahead of Apple in 64-bit mobile chip development with its first eight-core Snapdragon 615 chip for mobile devices, which has integrated LTE and 4K video rendering capabilities. The Snapdragon 615 will go into high-end smartphones and tablets, which should become available in the fourth quarter, a Qualcomm spokesman said in an email. High-end smartphones are typically priced above US$500. The 615 could be one of the fastest mobile chips with its eight CPU cores based on the latest ARM 64-bit architecture called ARMv8. Qualcomm also announced a quad-core variant of the chip, the Snapdragon 610, on Monday at the Mobile World Congress in Barcelona. So far only a handful of mobile devices with eight-core chips have been released, with Samsung's Galaxy S4 being one notable product. But those devices were based on 32-bit processors, and the new chips will be in a new generation of faster, speedier smartphones and tablets. Qualcomm will ship reference designs of mobile devices with the new chips to developers in the fourth quarter this year. The goal is to give early hands-on access so developers can write applications that take advantage of features on the chips. The Snapdragon 615 essentially reverses Qualcomm's controversial opinions about features in mobile chips the company made in the past. Qualcomm was caught off-guard when Apple put the first 64-bit, dual-core A7 mobile chip in the iPhone 5S, and questioned the benefits of 64-bit chips before reversing its stance. Qualcomm last year also questioned the benefit of eight-core chips, calling them "dumb." The new chips also put Qualcomm ahead of Apple in chip development with features like integrated LTE, hardware-based 4K video rendering and more CPU cores. Smartphones and tablets need 64-bit processing, and it is an "industry requirement" in the high-end device tier, said Murthy Renduchintala, executive vice president, Qualcomm Technologies, a subsidiary of Qualcomm, in a statement. 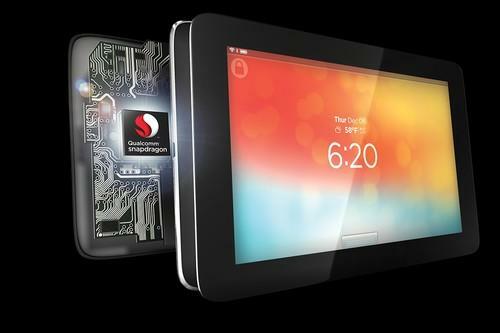 Qualcomm, whose is a market leader in mobile chips, now has three 64-bit Snapdragon processors. The company in early December launched its first 64-bit chip, the Snapdragon 410. Mobile devices will be able decode and wirelessly transmit 4K video at a resolution of 3840 x 2160 pixels with an integrated H.265 hardware decoder, Qualcomm said. The H.265 codec is one of two major 4K video formats available today alongside Google's VP9. The 4K video can be transmitted from smartphones and tablets to other devices like TVs that support the Miracast wireless streaming standard. The graphics engine will able to render 2560 x 1600 video, and support tools such as DirectX 11.2 that are used in the latest mobile games. It will also support programming tools such as OpenGL ES3.0 and OpenCL, so demanding tasks can be off-loaded from CPUs to graphics processors. The graphics engine, called Adreno 405, also has features to improve video effects in games. Qualcomm did not provide information about camera support. But with the ability to transmit 4K video, the chip will likely support high-resolution cameras. The integrated LTE modem will support the latest wireless technologies, including 802.11ac Wi-Fi and Bluetooth 4.1. No 64-bit ARM chip yet has an integrated LTE modem, with Apple offering a separate LTE modem on its iPhone 5S. MediaTek is expected to release a 64-bit ARM-based chip with integrated LTE. Integrated LTE modems save space, are more power-efficient and help reduce the size of a mobile device. The integrated communications processor in the Snapdragon 610 and 615 are based on Qualcomm's RF360 Front End solution, which supports major LTE bands and modes worldwide, the company said. Support for more LTE bands will allow phones and tablets to work with more wireless carriers, whose LTE networks are built on different bands and spectrums. The chipset also supports 3G technologies such as HSPA+, CDMA, and TD-SCDMA, which is widely used in China. Qualcomm also announced the Snapdragon 801 processor, which is an incremental upgrade from the 32-bit 800 chip that started shipping last year. The processor is faster, renders better graphics, and has wireless enhancements with support for 802.11ac Wi-Fi and more LTE bands. The Snapdragon 801 processors are targeted at high-end mobile devices.